Onkyo TX-NR5009 review | What Hi-Fi? The TX-NR5009 is the latest in a long and illustrious line of flagship home cinema receivers from Onkyo, and is a direct replacement for the TX-NR5008, a model we've used as a reviewing reference for almost a year. Predictably, then, our expectations for the new model were rather high. Our collective anticipation has been building for some time, too: all the way back, in fact, to the day we heard the £500 TX-NR609, the first of Onkyo's current generation of home cinema receivers, and the first to sport Onkyo's new, more rounded (some might say 'mature') sound. If, we reasoned, Onkyo could infuse its flagship model - already a formidably talented performer - with that same sense of poise and sheen of sophistication, then the result ought to be something very special indeed. In the metal, the TX-NR5009 certainly looks as purposeful as it ought. Gone is the old model's sloped front, to be replaced by a sleekly uniform fascia that anyone familiar with Onkyo's other receivers will find instantly familiar. However, the new model is, as you'd expect, both a great deal bigger and a sight more lavish in its fit and finish than its cheaper siblings: at 20cm high, 46cm deep and 25kg, it's a beast, one that many racks will struggle to house. Internally, the Onkyo is built around a massive chassis with separate side and front panels, all the better to resist unwanted vibration. Within the chassis, its layout is divided into three key areas, the first containing a massive toroidal transformer that feeds two smaller power supplies - one for the video processing, the other for the preamp stage. A massive central heatsink then runs across the middle of the unit, with nine individual amplifier cards bolted directly in, fed by two huge capacitors and cooled (when necessary) by discrete thermally activated fans. a lot of it, as you'd expect. 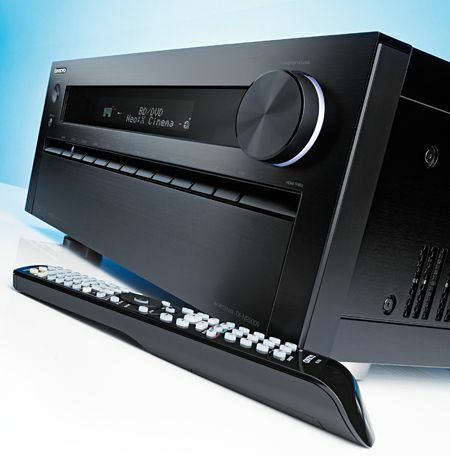 Even by the standards of its class, the Onkyo bristles with technical intent: it includes six of Burr-Brown's 32-bit/192kHz DACs (the PCM1795 model) plus 32-bit processing, 4K-resolution-capable Marvell QDEO upscaling and the latest HQV Vida video processor. Every hot ticket in home cinema's hall of fame is present and correct too, from THX Ultra2 Plus certification through to state-of-the-art processing options such as DTS Neo:X.
Needless to say, you'll find every input under the sun adorning both its front and rear panels, too. If you manage to find a way to utilise every input on a TX-NR5009, we dread to think how complex your system is. Setting up a receiver this powerful is, as you'd expect, not the work of moments, but Onkyo does its best to make life easy, thanks in part to its Audyssey MultEQ XT32 automatic calibration, equalisation and room-correction technology. Having said that, if you connect the TX-NR5009 into every one of its nine potential speakers and both of its subwoofer outs, best be prepared to devote quite some time to that calibration process. But once your labours are completed, be equally prepared to write off your first evening in the TX-NR5009's company, because once you've turned it on, you'll be rapt by the quality of its performance. Even huge dynamics are shouldered aside with swaggering ease, from the crashing space battles of Star Trek to the genuinely scary, sofa-shaking explosions of Saving Private Ryan. as we did, you run the TX-NR5009 in its full nine-speaker, twin-subwoofer spec, using the DTS Neo:X Cinema mode to generate the necessary additional audio channels from your soundtracks. If that's not for you, you can redirect the unused power amp channels to other tasks, such as multiroom applications or biamplifying your front speakers (and the latter is well worth investigating if music figures high on your agenda). And well it might, because the Onkyo has plenty to commend it in stereo. As we'd hoped, its sound is cut from the same cloth as the TX-NR609, in that instead of running roughshod over a complex rhythm, the Onkyo pays attention to nuances and is capable, especially in its Pure Direct mode, of mustering a decent sense of timing. Which is just as well, given that it can stream online music from a wide range of sources, including Aupeo!, Last.fm, Napster and Spotify, plus most key file types (save Apple Lossless) at up to 24-bit/96kHz quality via your network.